What is causing the pain in the balls of my feet / forefoot pain? When we talk about the pad of the forefoot (or ball of the foot) it seems like a reasonably big area – perhaps a bit smaller than a pack of cards. The five long metatarsal bones that come down inside your forefoot touch the ground only at the far end. Together, these five bones make up a surprisingly small surface area of ~ 6 cm² or a couple of square inches of actual weight bearing structure. The long bone in the foot leading to the big toe is the 1st metatarsal and it makes up nearly half of this area and should consequently take nearly as much of your body weight when standing, walking or running as the other four combined. Around 40% of the population has a issue with the stability of the 1st metatarsal bone that they were born with, where the mechanism by which the 1st metatarsal stays in place doesn’t work properly. Instead of it pressing on the ground and bearing your weight as it should, it pivots up away from the ground, leaving the other four bones to do its share of the work as well as their own. 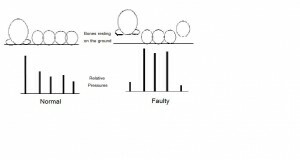 This changes the pressure map as shown in the diagram below with normal weight bearing proportions shown compared to abnormal. You can see from the diagram that the 2nd metatarsal bone, which is quite a fine bone, is bearing a far higher proportion of your body weight than it should. 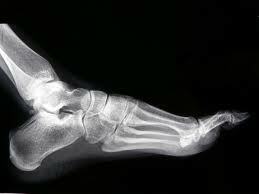 This can lead to pain in the 2nd, 3rd or 4th metatarsals heads as the bone bears too much pressure and becomes bruised. If this overloading goes too far, the bone can break at its weakest point where it narrows just behind the weight bearing area. This is called a stress fracture and can occur in anyone but is most likely in women after menopause as the bone density drops off more rapidly. To view this cluster of FAQs related to the forefoot as a single document in downloadable / printable format, please browse to our Forefoot Pain Info Sheet. Use this link to return to the Podiatry FAQs.